My plan, going into this year's spring break, was to step away from most of my daily work to focus on another project that demands my attention. I decided that I'd do at least a little bit of Quizlet every day, to keep my vocabulary fresh. And while I mostly stuck to that plan, I found myself accidentally using my Luganda skills anyway. I visited Northwestern's library early in the break to try to access some primary source documents I need for a history paper. (It was also a nostalgic visit back to my alma mater, and specifically to the Africana library at NU, where I had a carrel and worked on my first big research project as an undergraduate, ten years ago!) 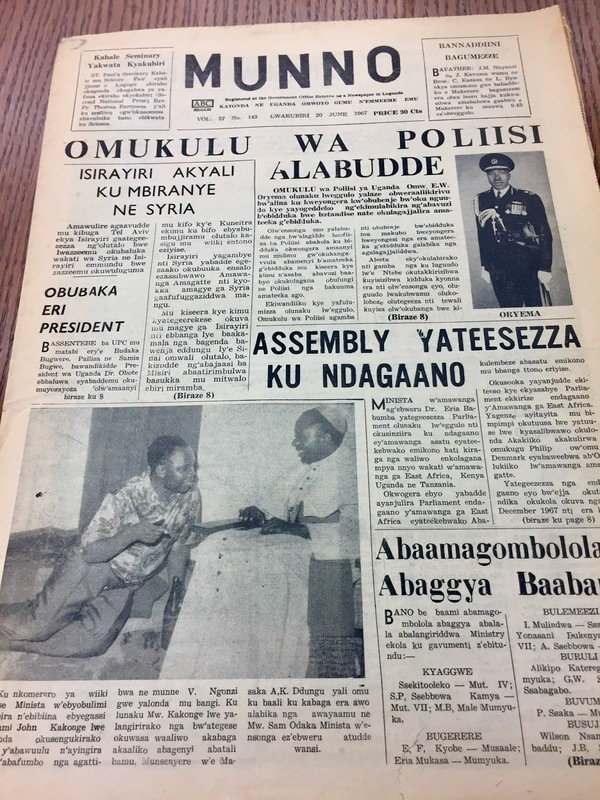 The library had some more "recent" editions of Munno, the Luganda-language Catholic newspaper that I thought I would look at to see if there was anything relevant to my research project. This was my first chance to really use Luganda to achieve an academic goal. And boy did it feel good. I felt like hot stuff flipping through Munno, able to read it, able to discern what might be useful to me. Unfortunately, the copies of Munno that I looked at did not contain any relevant articles for my research. But the act of looking was valuable in and of itself! And the sense of achievement didn't hurt either. Because of this experience, I decided to include this use of Luganda in my ISP! You will see several changes reflected in the updated document, including points in Omuzannyo for historical research in Luganda. Throughout the spring break week, I did do my Quizlet exercises as I'd intended, and apart from the history work, I didn't do much other significant work. But I must have missed Luganda because I did dream in it (partially at least!) one night over the break. The week before spring break was an average one for my studies. I did many of my normal activities, including listening to the radio, watching the Jesus video at length, keeping up with my Quizlet exercises, and meeting with my language mentor. Simon and I actually met for two hours because of scheduling difficulties. I was slightly worried about how it would go, but it was actually a great session and a productive two hours. I am noticing that Simon is increasingly correcting me on small elements of my grammar (when to use ku versus mu versus i, for example), and I feel like some of the adjustments are starting to stick -- even when I don't have a hard and fast rule for the grammatical details. During our Multilanguage Seminar class check-in right before the spring break, we discussed briefly the difficulty of finding reading material at an intermediate level. The universe seemed to respond to this challenge rather quickly for me, because when I started to read through Munno, I found it to be more manageable to read. The grammar seems much simpler than Bukedde, for example. I am curious why that might be - assumptions about the literacy levels of their audiences? More sophisticated grammar developing over time? In any case, in addition to using Munno as a historical resource, it may also fill in the intermediate reading gap that I've been dealing with! This coming week I am looking forward to diving right back in to Luganda. In fact, Luganda was the very first thing I tackled this morning. I was pleased to find, as I worked on some writing exercises, that it was all intact. In all, then, spring break provided me with a little bit of breathing room, a chance to expand my uses of the language, and it didn't set my progress back. I'm calling it a win!